Found on the Mobile Web is a weekly WAP Review feature listing newly added and updated sites on the YesWAP.com mobile portal and WapReview mobile site directory. With these latest additions the directory and portal now list 2195 mobile sites. Papa John’s Pizza US mobile.papajohns.com Inspired by Ewan’s coverage of Papa John’s UK’s location aware iPhone web app, I went looking for its US equivalent and found this snazzy Touch web version. Sadly, unlike the UK version, it doesn’t use the phone’s location, you have to a enter an address or zip code manually. By default only iPhones get the touch site, other phones, including Android devicess, get a plain version with no eye candy whatsoever but identical features and functionality. 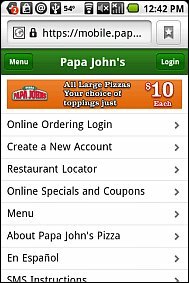 If you want to try the iPhone version on your unblessed device the direct URL is mobile.papajohns.com/iphone. 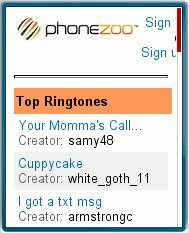 Phonezoo m.phonezoo.com is a user generated content site where users can upload and download ringtones, photos and wallpapers. Phonezoo also has horoscopes and a selection of games. I wasn’t able to download any of the games as the site claimed that none of them were compatible with my N95! Phonezoo is ad-supported and all content and services are free to end users. 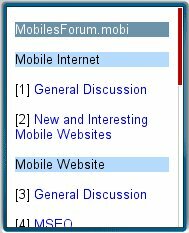 MobilesForum.mobi mobilesforum.mobi/?wap2 Mobile edition of a new online forum targeted at anyone interested in Mobile Web News and Discussion, Mobile Website Development and Mobile Domains. The mobile version is good for basic phones but a bit limiting. The full version of the site at mobilesforum.mobi works well on modern touch and full-web browsers. 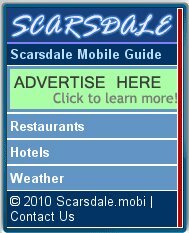 Scarsdale .mobi scarsdale.mobi Guide to Scarsdale, NY restaurants and hotels plus seven day weather forecast. Listings include address and click to call phone numbers. Source: Mobility.mobi. 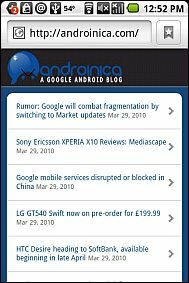 Androinica androinica.com, aka “The Google Android Blog” offers app and phone reviews, news, tutorials, and tips for Android users. The attractive touch web site works well with Android and other smartphone browsers and with server assisted browsers like Opera Mini. Smashing Magazine m.smashingmagazine.com One of the top online web design and development resources, Smashing Magazine provides tips and tutorials, reviews of design and development tools and free font, icon and template downloads. The site’s mobile view was created with Mobify’s online design suite. 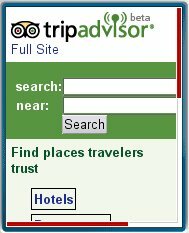 TripAdvisor tripadvisor.com The venerable (founded 2000) crowd sourced travel review and recommendation site finally has a mobile edition. It includes hotel, restaurant and attraction reviews by the TravelAdvisor community. The site is location aware on the iPhone and Android phones. Listings include reviews, ranking compared with similar, nearby establishments, driving directions and click to call numbers. Hotel listing also include links to reserve a room using Hotels.com, Expedia or Orbitz. Source: IntoMobile. This entry was posted in Android, Found on the Mobile Web, News Sites, Travel and tagged FOMW, local search by Dennis Bournique. Bookmark the permalink.